To hear George and Sue Viener talk about their eyes, you’d think they were ophthalmologists. Together, they have been looking keenly in the same direction for most of their lives. Their focus? American outsider, or self-taught art. They became collectors and dealers of this uniquely American art form not because they themselves are artists, but because they acquired an eye for it. They learned to see. The folk art-collecting bug first bit them in 1970 when they visited the Abby Aldrich Rockefeller Museum in Williamsburg, Va.
George, a former textile executive, started honing his gathering skills with cigar-store Indians. At one point, George and Sue had 13 of them in their house. Their eyes have been focusing ever since. In 1986, the Vieners met Chuck and Jan Rosenak in Santa Fe, N.M., and their collecting vision sharpened. “Our eye was ready to see this art,” George said. Over the decades, the Vieners collected artists as well as art. They’re a walking two-volume encyclopedia of outsider art. “The hunt is more than half the fun,” George said. 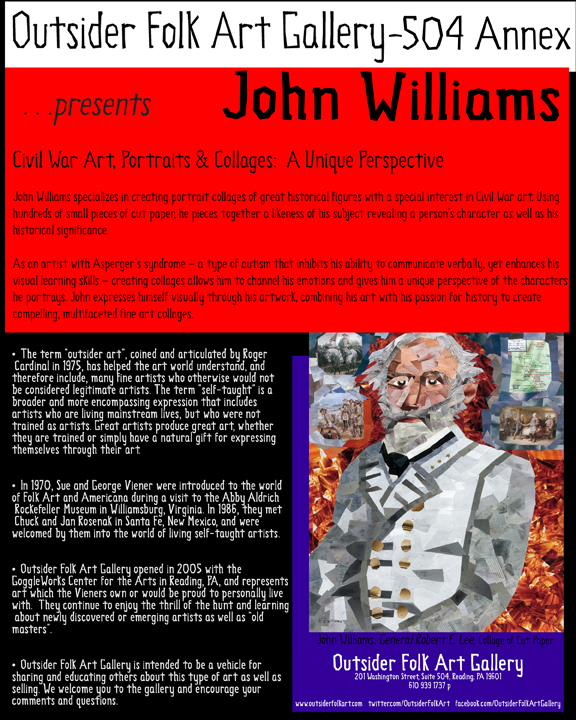 They have met or collected art by such luminaries as Hattie Brunner, June and Walter Gottshall, Sterling Strauser, Jim Bloom, Thornton Dial and many others. She had to admit, though, that it’s not to everyone’s taste. “Some people hate it,” she said. Pennsylvania artist Sterling Strauser (1907-1995), a champion of self-taught artists, was an especially close friend even though they met him just five years before he died in 1995. Decades on, they are getting ready for the next phase of their lives: retirement. Pieces of art leaned against the walls of their Reading home as George led a tour of their house-sized gallery, waiting for movers to take the pieces to Leesburg, Va., where the Vieners will move for the first time in more than 40 years. Even the laundry room bore the stamp of these indefatigable collectors: a small display of sculptured work graced a corner that would have gone unnoticed otherwise. Meanwhile, the Outsider Folk Art Gallery, which the Vieners have operated since the GoggleWorks opened in 2005, also shows signs of an era ending. Although it will close Sunday, they will keep a hand in buying and selling outsider art on 1stdibs.com, “The most beautiful things on earth.” Several auction houses are handling their vast collection and a local warehouse will contain some of their treasures. 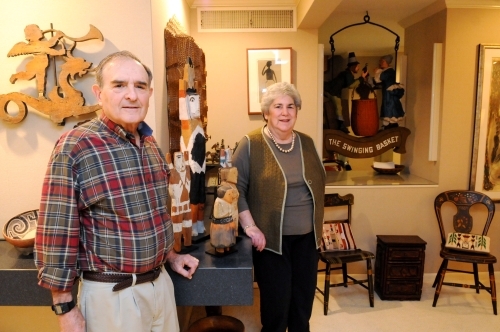 The Vieners reflected on their 43 years on Rockland Street, in the house that seems to go on forever and to be especially suited to these collectors. They also looked forward. “It will be hard to leave the community,” Sue said. “Everything in life is a new challenge,” George said in counterpoint. As the tour of the house ended and George’s attention had to return to the business of moving, he passed a few more paintings leaning against a wall, one of them a portrait of a young girl. It was Sterling Strauser’s daughter, Jill. Contact John Fidler: 610-371-5054 or jfidler@readingeagle.com. 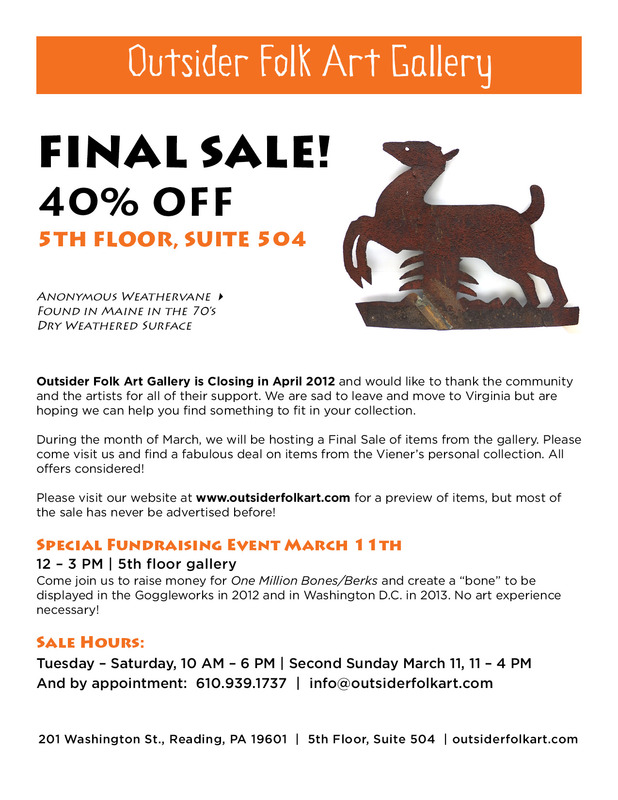 It’s March Madness 40% off this month at the Outsider Folk Art Gallery!